Sorry, no longer available. 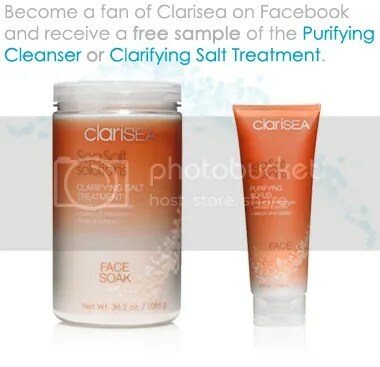 Become a fan of Clarisea on Facebook and get a free sample of Purifying Cleanser or Clarifying Salt Treatment. You will need to email your name, address, and sample choice to the email address on their Facebook page to get the sample via USPS within 3 to 5 business days. When you ask for your sample, you’ll be signed-up for the Clarisea eNewsletter. Thanks goes to BeCentsable for sharing this new Facebook freebie with me! Don’t forget to become a fan of Freebies 4 Mom on Facebook. This is where I share all the freebies and coupons plus more with my 44,000+ fans (and they share great freebies and coupons with each other). You can also become my friend on Facebook – I love to chat with my readers and friends about good deals. My readers are my best source of information about freebies and coupons! I think they just canceled this promotion, something about an "unauthorized posting." I can't tell if you still get a sample if you already requested one. The notice went up 3 minutes ago. I became a fan and they did not give me an opportunity on their page to give them my address for my free sample. Are you sure you are not suppposed to email them for it? That's what BCentable's blog seems to imply. "Thank you everyone for your interest in Clarisea. There was an unauthorized posting of our ad so we had to take down the free sample promotion. We are very sorry for the inconvenience. -Clarisea"